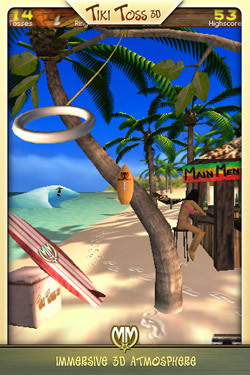 Delray Beach, FL– November 11, 2010– Mellow Militia, developers of Tiki Toss 3D, will be aligning with The Surfers Healing Foundation for Autism, to donate 2% of Tiki Toss 3D’s profits to the cause. 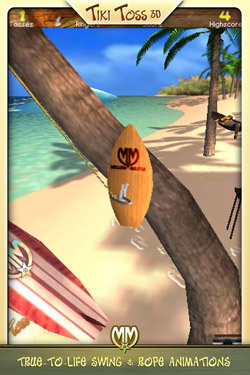 The makers of this relaxing beach-side hook-and-ring-toss game for iPhone and iPod touch, will also be donating an iPad and six art boards for auction at The Surfers Healing Art Benefit and an iPod touch to The Surfing Santa Contest on November 20, 2010 in Southern California. 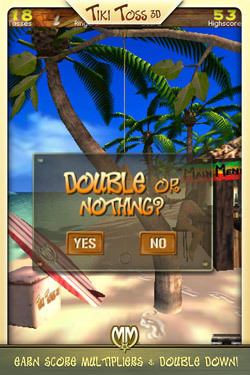 Tiki Toss 3D is a digital rendition of the classic beach and bar game. A metal ring, tied to a rope, dangles from a branch overhead. Players ‘swing’ the ring with a swipe of their finger, and try to catch it on a mounted hook. Along with realistic animations and 3D graphics, the addictive game-play delivers fun and relaxation, with a dash of competition thrown in. Players can track their high scores on global leaderboards and challenge their friends via Facebook and Twitter. Surfers Healing was founded by Israel and Danielle Paskowtiz, and is dedicated to helping autistic children find respite through surfing. Their son, Isaiah, was diagnosed with autism at age three and like many autistic children, he often suffered from sensory overload. A former competitive surfer, Israel hit upon an idea and took to the waters with Isaiah on the front of his board. The two spent the day surfing together and Israel realized that surfing had a profound impact on his son. He discovered that this unique surfing therapy can be highly beneficial to autistic children. After the experience with Isaiah, Israel and Danielle decided to begin hosting day camps at the beach for autistic children and their families, helping them discover the healing effect surfing has on children with the disorder. “The healing powers of the sun, water, and sand are undeniable and real. This truly relaxing therapy that Israel and Danielle discovered to benefit autistic children is phenomenal and inspiring, and we love being a part of it,” says Kyle McGetrick, Co-Founder of Mellow Militia. “Supporting the Surfers Healing cause is extremely important to us as both parents and surf lovers,” says Chris Puglisi, Co-Founder of Mellow Militia. Mellow Militia joins Hawthorn Cat, Paskowitz Surf Camp, and Variety, a children’s charity in Southern California to support this cause. Information on The Surfers Healing Art Benefit and The Surfing Santa Contest can be found on the The Surfers Healing Foundation for Autism website. Review codes available upon request. 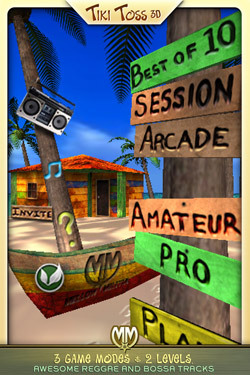 Mellow Militia is an international developer and publisher creating highly addictive, innovative and entertaining digital games for mobile devices. Founded in 2010, by Chris Puglisi and Kyle McGetrick, Mellow Militia is small team with a big passion for producing high quality products that challenge the limits of technology and embrace exceptional design. With an emphasis on being environmentally conscious, Mellow Militia is positioned at the intersection of cutting edge software and eco-friendly design.